A Tonk's Tail... err, Tale...: DIY Kitty Gingerbread House! Since last night marked the first night of Chanukah, we were feeling a wee bit festive around the house. It's honestly been a bit festive this entire week, starting with the Big Blizzard that arrived during the Thanksgiving holiday! 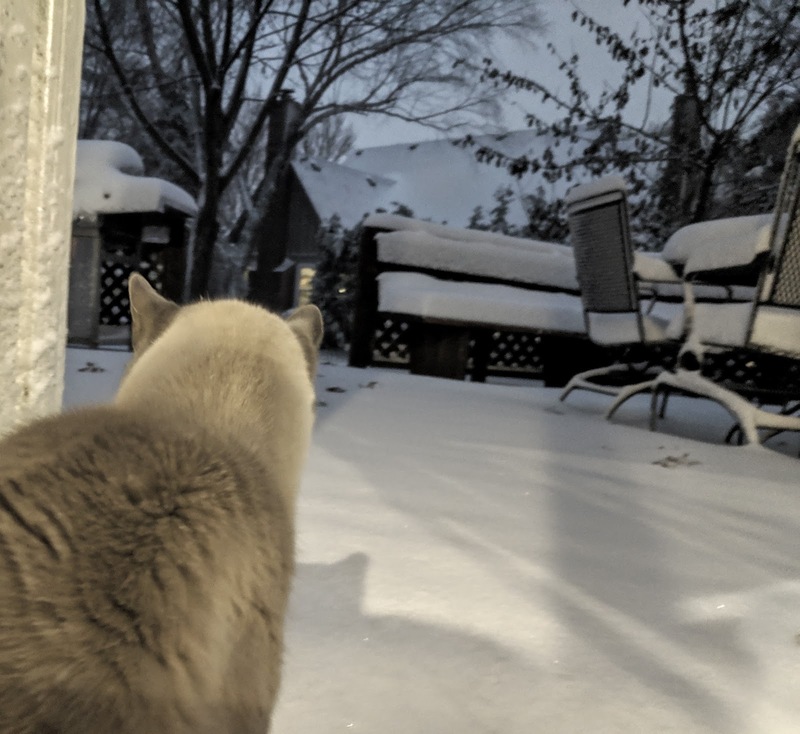 (cue requisite shot of snow from crappy camera phone...and back of kitty's head. we thought we'd resurrect a fun DIY project we did a few years back. We present: Your very own DIY Gingerbread House. Maxwell: "Don't mind if I do." Faraday: Are you vandalizing the bushes in front of my house, Maxie? All you need is a nice, big cardboard box, a box knife, and some sturdy tape. For decor, we have some candies, snow trim and gingerbread men you can download and print (links at the end of this post). Just adhere them to your house with a bit of white glue and you're ready to enjoy! What a great gingerbread house! 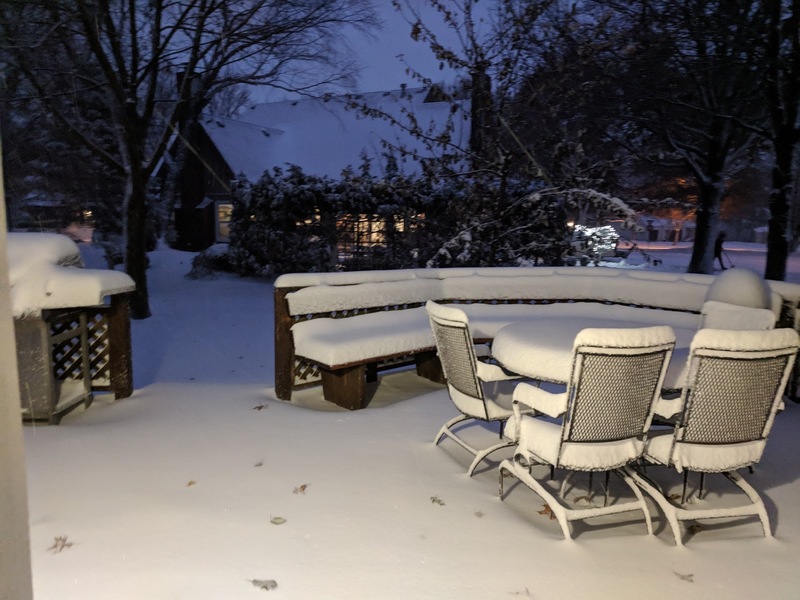 And wow, that's a lot of snow. Someone told me we were forecast snow this week, but all the forecasts i've checked just say rain! Typical Scotland. Happy Chanukah! Da Boyz would rip anything like this to shreds in no time, so I'll stick with heavy cardboard boxes and scratcher beds for their amusement...LOL! That is cool! I have plenty of boxes to test it on. We don't like the white stuff either. Great looking kitty gingerbread house. We did one for Halloween that we saw online. Now we are going to make this one. Thanks for sharing the video and the cute photos. Have a wonderful day. You have more snow than we do! You can keep it too! Now that is super cool for cats! We could do it in XXXXXL to make it a dog house. Love the idea. 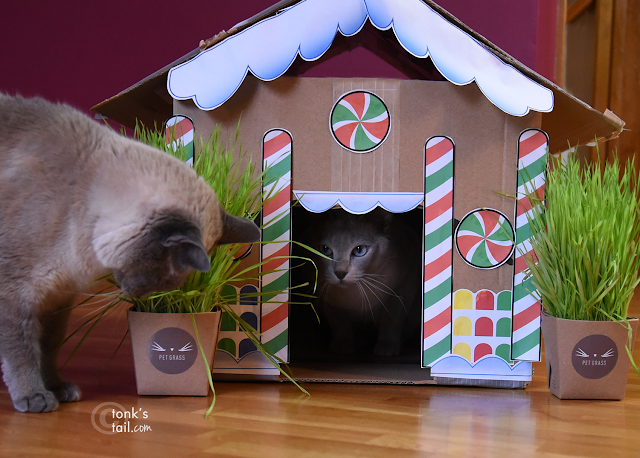 My kitties have a gingerbread style scratcher house from Target they just love. Impressive work, plus bonus greens!